My friends on Facebook say I always take great pictures. I enjoy such comments, but it is not quite the truth. The truth is, I always take a very large number of pictures and I just post some of the few good ones. 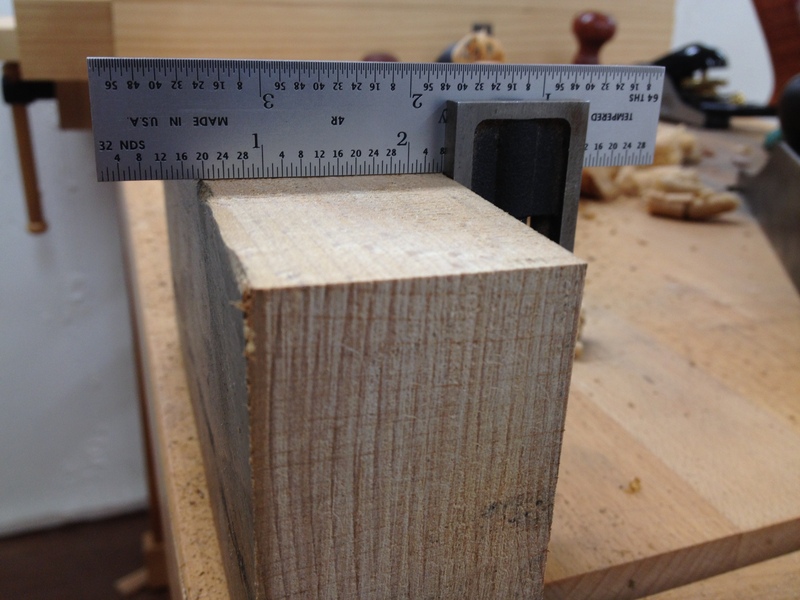 I think, more often than not, woodworkers tend to update their blogs in much the same way. We discuss, photograph, and write about our creations, achievements, and the positive things going on in our shops and do not spend as much time going over the ideas and projects that did not work out. It is not that way because we are trying to deceive, but because we would prefer to talk about our successes rather than our failures. This is to our detriment, however, as we can learn from mistakes. I try to learn from the mistakes of others; that way, I don’t have to make those same mistakes myself. I am happy to point out and discuss my failed woodworking attempts. I offer these in the hopes that you will offer reciprocity. In this case, it might be better articulated as a lacking of skills, rather than a failure of process. Or maybe it is a combination of both. In any case, as hard as I tried, I was unable to properly drill the larger holes needed to handle the 3/16 alignment pins. 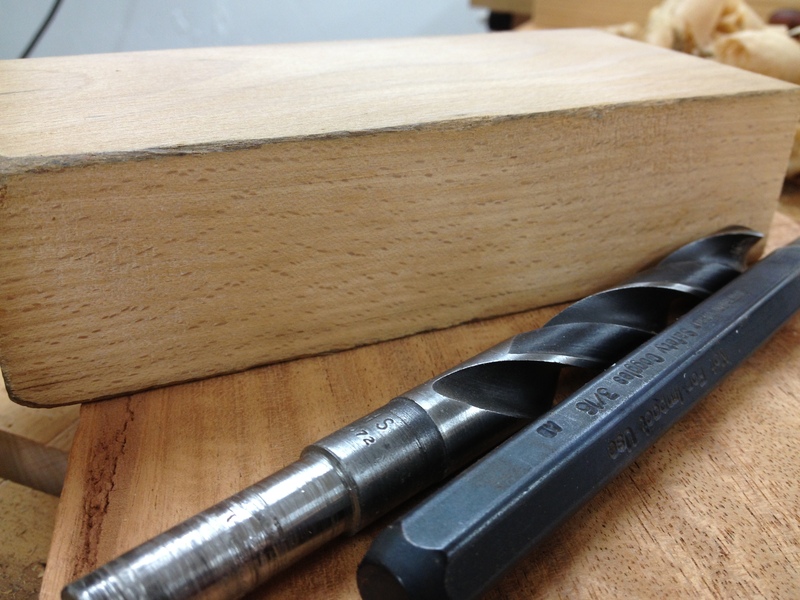 I only have a few power tools in my shop – a bandsaw, a drill press, and now a lathe (more on that later). The drill press is a bench-top model 15-000 from the early 1960’s. I bought it from the original owner, who kept it in fine condition. Unfortunately, it does not have the capacity to handle a 6 ½” blank along with a 5” long drill bit, so I have been trying to drill the holes by hand with a brace. I did not have a problem with the 13/32″ holes, so drill bit size probably played a role. 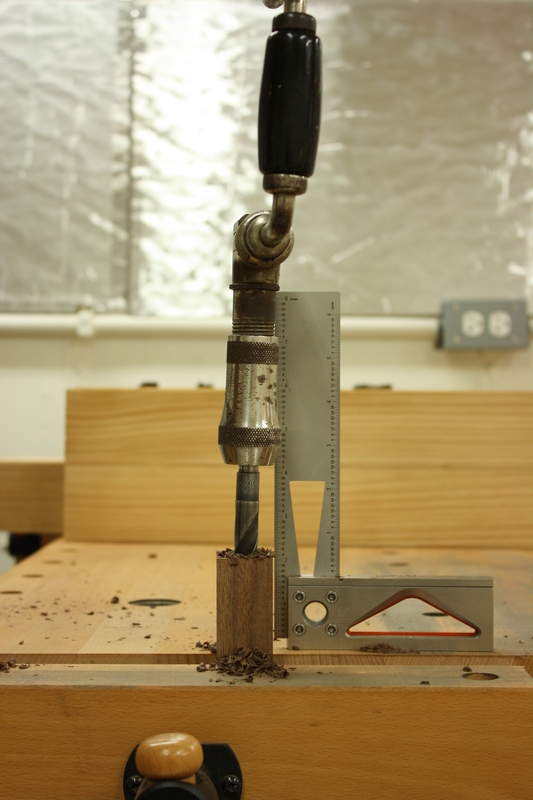 I suspect some of the other reasons for my failure are situational, as well, and that I might find it easier to drill a perfectly perpendicular hole were I a) drilling into face grain instead of end grain and b) using a brad point or self-driving bit instead of a twist bit. 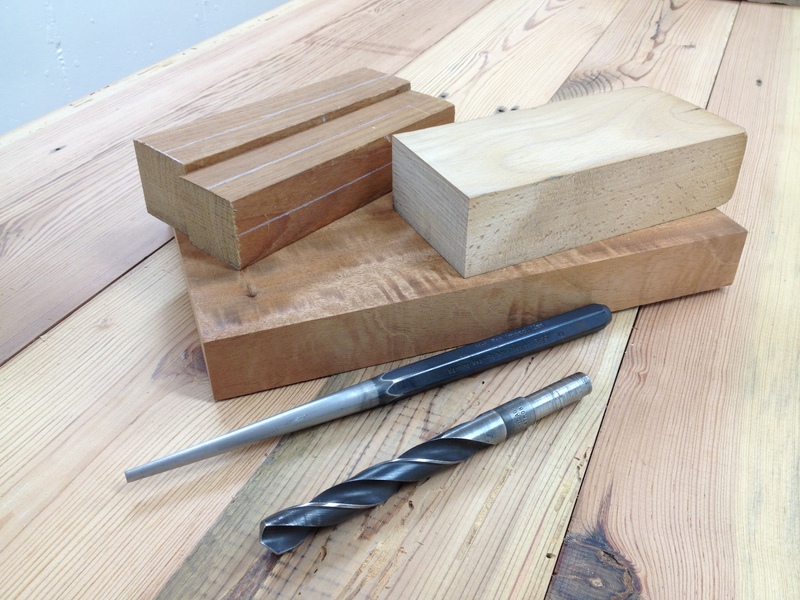 But the holes, by nature, must be drilled into end grain and I had a hard enough time trying to find a 17/32” twist bit; I don’t know if the other styles are even an option for that size. Attempt after attempt, I was left with holes that were off-center and just off of perpendicular in the blanks. The result was either a poorly fit or misaligned handle or I would expose the other end of the hole when I was cutting the taper in the blank. And so, after wasting about six blanks and gaining some incredibly sore shoulder muscles, I put the larger drawbore pin project on hold, just until this weekend when I can get access to a floor-model drill press. I figured while I had the use of the drill press I would go ahead and drill out a few extra blanks and make some additional drawbore pins. Maybe I’ll give away a pair through the blog. Or make a pair for Finley to use when he’s older. Or both. 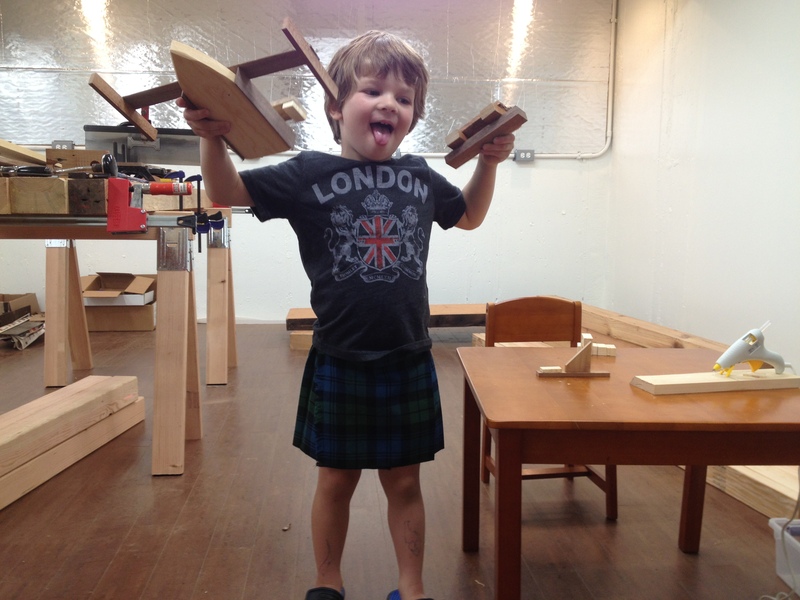 The other day, I spent some time in the shop with my protégé. 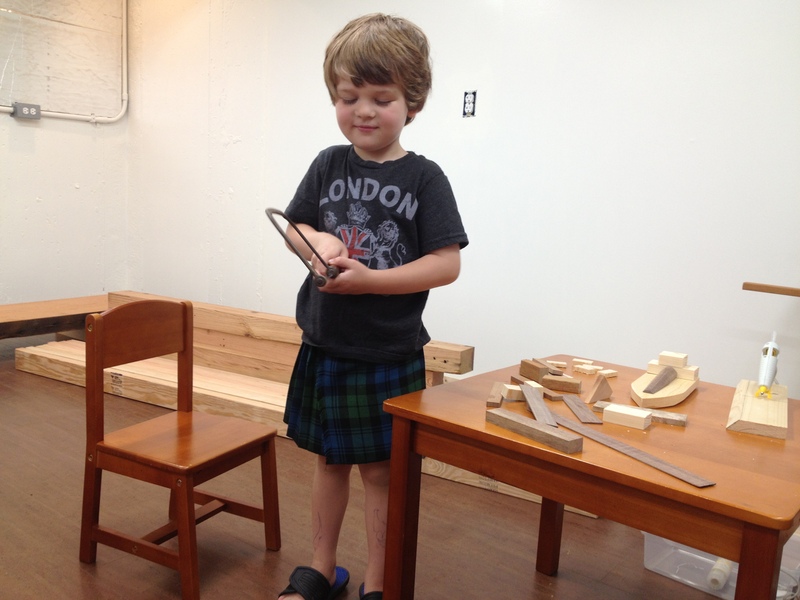 (For the record, he suggested wearing his kilt all on his own. Also for the record, I did tear up a bit.) He wanted to make some boats. I showed him how to use the coping saw and we cut a piece of pine into a boat shape. Then we cut up some small blocks of pine, walnut, mahogany, and cherry to use for cabins and such. He went through the box of wood trash I keep near the shop door and grabbed a few additional pieces with shapes he liked. For speed and simplicity, we glued everything together with hot glue. As you can see in the above picture, a piece of tapered and chamfered walnut from one of the failed attempts at the drawbore pin handle got repurposed into the cabin for the large boat. I couldn’t get him to not make a goofy face. He was very excited to be down in the shop with me, if you can’t tell. Last night I started prepping a few more handle blanks. WARNING: If you have any love for the Stanley transitional planes, you might want to stop reading this entry now. A while back, I saw an eBay listing for a Stanley transitional jointer plane. It was missing the blade and lever cap and the casting was broken. But it had a starting bid of $1.99 with no reserve and I had an idea, so I bid on it. If you can imagine, I was not shocked when I won the plane for $1.99 (plus shipping). When I made my payment, I asked the seller if they would remove the metal parts and just send me the wood, because all I really wanted was the beautiful quartersawn beech I knew was hidden under a layer of filth and dirt. I left it as an oversized block for the time being and gathered up a few other choice pieces of wood. The two pieces of wood with the white lines along the faces are teak. Back in 2003, I attended a conference for the Society of Technical Communicators (Oh, it was as exciting as it sounds) in Baltimore, MD. I had a chance to visit relatives in Silver Springs and while I was walking down one of the many streets of shops there, I came across a box of wood next to an open door. It was a woodworker’s shop and he made teak patio furniture. The wood in the box was chair and table legs with blown mortises or broken tenons and free for the taking. I had no idea what I would do with it at the time, but I grabbed the largest chair leg I thought I could fit into my suitcase. It sat in my shop for 11 years until I came across it last night and figured a pair of teak handled drawbore pins might be nice. The white lines indicate the two non-tapered faces, which was useful information when I had it on the miter box and likewise will be useful when I’m cutting them down to proper dimensions on the band saw. The figured mahogany is… well, it’s just some figured mahogany I picked up somewhere. Happens to be big enough for handle blanks and I like figured mahogany, so I thought I’d give it a try. I might root around for a few other pieces of wood this evening. 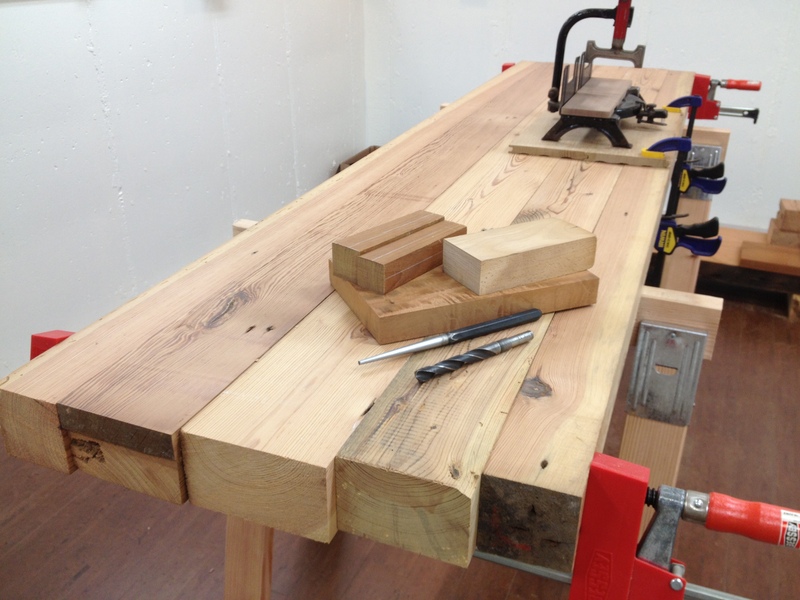 Anyone with keen eye sight AND amazing powers of observation might notice I have located another piece of heart pine beam that is long enough for the bench top (second from the right)! So I don’t need to make any fancy transitions or explanations as to why my bench top has a weird shape. This makes thekiltedwoodworker very happy. I am amazed that such a fine son of my husband, “particular” as they both are, might live this long in close proximity to that jagged-edge workbench without evening the front edge. Dad said measure twice, cut once. Like he had to say that–but of course I’d just whiz it off with an electric handsaw. I don’t see any reason to measure it. The top isn’t even glued up yet, mom. Two comments: There is an old saying from back before digital photography. The quality of a photographer is usually measured by the size of the trash can. 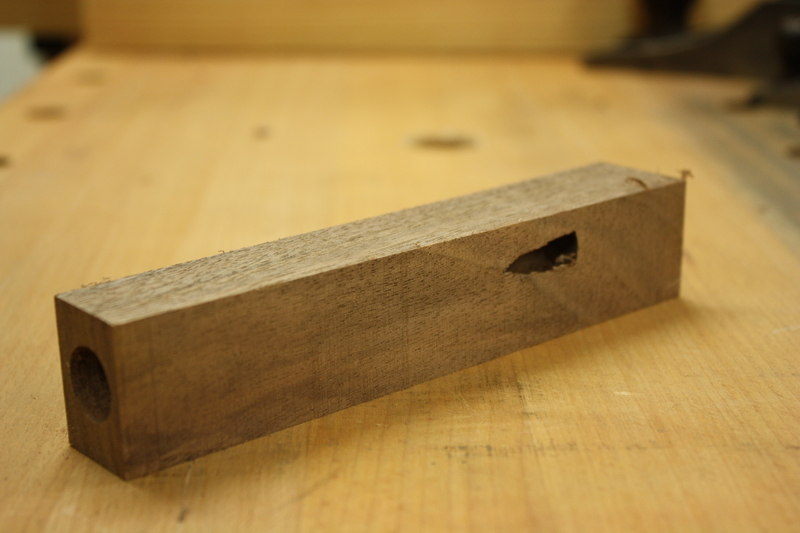 Second, you may have been able to use that transitional plane for jointing edges. 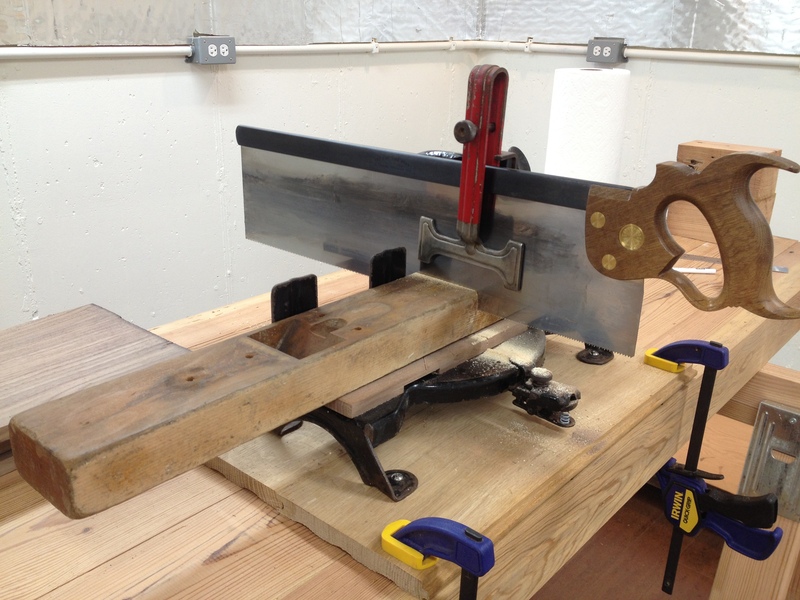 I squared mine using a 6″ jointer and now use it on its side on the bench top. Chris Schwarz demos the technique somewhere. It works like a charm. Believe it or not, I’m old enough that my photography class in college was with 35mm film. 😉 My trash can was always full. Also, I don’t miss developing film. I have a really great pre-WWII #7 that I picked up off CL for $25. I work very hard to NOT be a plane collector, with one very small exception that I’ll write about some day. I bought the transitional specifically because it was a huge piece of QS beech and I didn’t feel badly about “repurposing” it. Paul sellers had a segment of his Woodworking Masterclasses on building wooden block planes. The wood he used was from large wooden jointer. Unfortunately, I stumbled across that transitional jointer at that price through pure dumb luck. Most of the time, even broken transitional planes at estate sales and antique stores have price tags far above their actual value.